If you have bought an iPod, you might be wondering about how to sync music from your PC to your beloved iPod. If you have lots of music on Spotify and how to sync the spotify music to your iPod. If you don't want to use iTunes directly because it is complicated, then you have to use a third-party tool in order to sync Spotify to iPod easily and efficiently. There are many software services that can do this task. But, iMusic can be considered as the most trustworthy and efficient of them all. It can be proved to be useful if you know how to handle it. Open Spotify and from under the tab called "PLAYLISTS" given on the left side of the Spotify interface, select the playlist you want to download. Then, right click on it and press "Copy Playlist Link". Of course, you can also copy a song or an artist link. Go ahead and double click the iMusic icon to launch it on your PC. And then click the "Get Music" which on the top of the interface and then select "DOWNLOAD" option as the screenshot. Now, paste the Spotify link you had copied earlier in the space provided and hit the Enter key or simply press the Download icon or button as shown in the screenshot below. As soon as you hit the Download button, iMusic will start downloading the Spotify tracks for you. After downloading the spotify music, go to the "iTunes Library" and select the music you want to transfer to iPod. Please make sure you have already connected your iPod to computer. 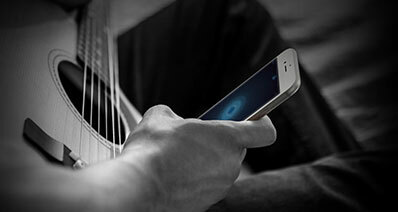 At first, download and intall iMusic. Then launch iMusic and connect iPod to computer. The iMusic can detect iPod automaticlly. Play the music on Spotify which you wish to record. In order to record from Spotify, open your Spotify account and then play the music. As the music is played on Spotify, click on the iMusic "record" icon which is on the bottom of the interface as the below screenshot and the track will automatically get recorded. TunesGo Retro - iOS Transfer is an exclusive file transferring and synchronizing software that can be efficiently used to sync Spotify to iPod. Awarded with the quality of its service, TunesGo Retro is a well known name and is certainly the tool that can transfer Spotify music to iPod or other iDevice easily . Works with both the Windows and the Mac OS platforms. Lets you sync iPod with Spotify in order to transfer files from iTunes to your iOS device and vice versa. Transfers the music and all the relevant data as well (like rating, artwork, tags) related to it. 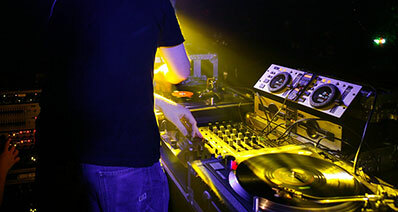 Offers a powerful database that keeps extensive information about the songs. Gives you the option to transfer only those files that you need. Helps you efficiently identify duplicate media files during the transfer process. Successfully converts any incompatible media file to a compatible format for the iPod. Allows you to back up your data so that you can restore it later in case you were to lose any. In order to sync Spotify to iPod with the help of TunesGo Retro, you must first download your Spotify music on to your PC. 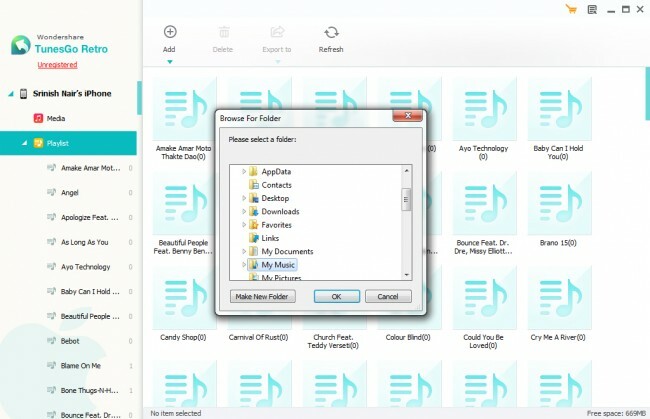 Once you have your Spotify music on your PC, it is very easy to transfer these files to your iPod using TunesGo Retro. You will find the easy steps to sync Spotify music below. We have used an iPhone(screenshots) to explain them, however, the steps would remain the same for your iPod too. Open TunesGo Retro and connect your iPod to your computer using the USB cable that comes with your iPod. Once your iPod has been connected and identified by TunesGo Retro, click on the "Playlist" tab from the options given on the left side of the TunesGo Retro interface. 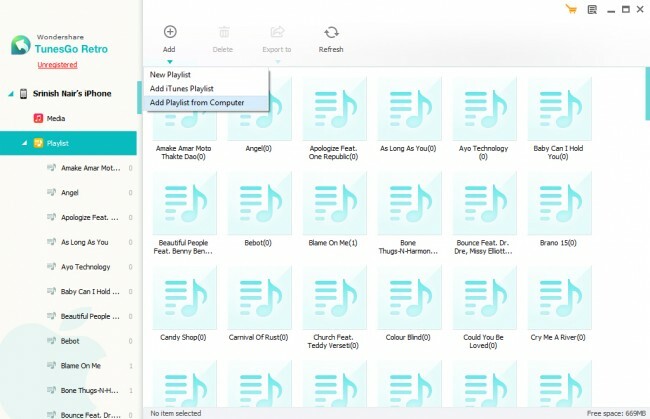 For the final step, you simply have to add a new playlist by clicking on the triangle under the "Add" button and then selecting the option of "Add Playlist from Computer". From the next popup window, select the folder where you have saved your Spotify music and press "OK". That's it, TunesGo Retro will go ahead and now sync your favorite and selected Spotify music from the specified folder to your iPod in an instant. It goes without saying that since the advent of cloud based music streaming services, iTunes has lost quite a bit of its sheen as the default music manager for your iPod. Spotify is one such service and is also one of the primary reasons why my iTunes is gathering dust on my computer for long now. With tons of music on Spotify being just a tap away, we all are simply hooked on to it. 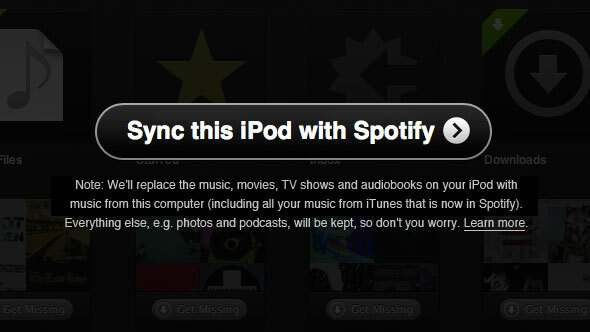 In fact, now that Spotify even allows you to sync your iPod. 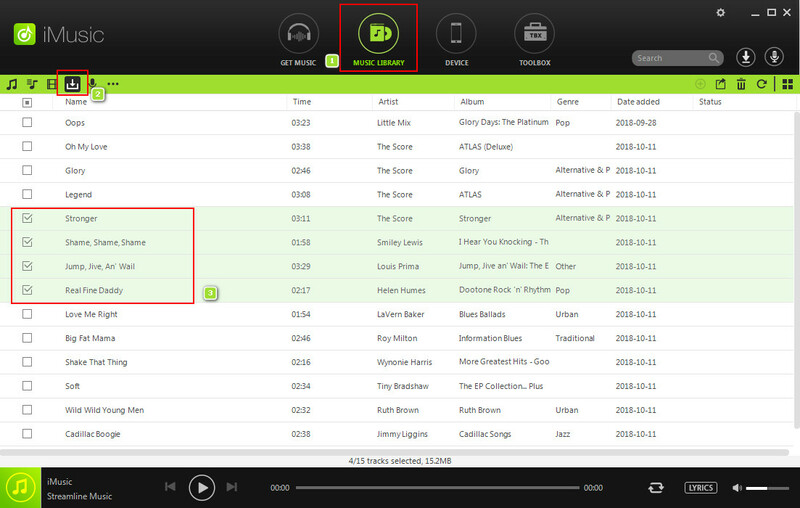 Below we will provide detailed steps about how to sync iPod with Spotify App. Step 1. 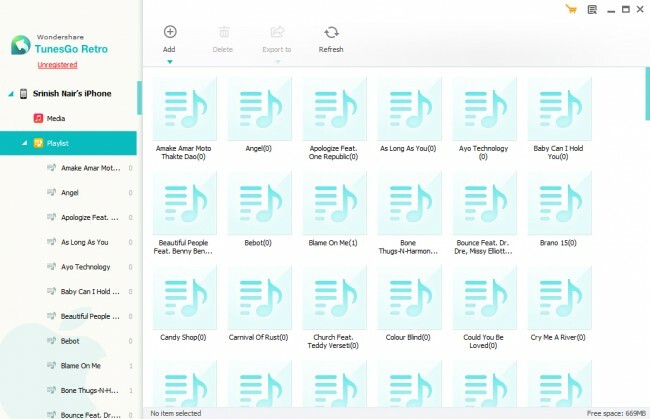 To begin with, go ahead and download the Spotify Software on to your computer and install it. Here are the download links: Mac or PC. Once the installation is successfully done, launch the application. Step 2. 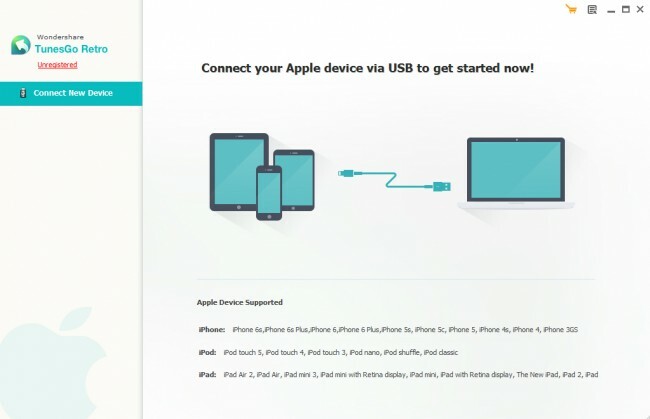 Now, grab your iPod and connect it with your computer using the USB cable. You will see that the Spotify will soon identify the connected iPod and show it under the tab called Devices on Spotify interface. Step 3. 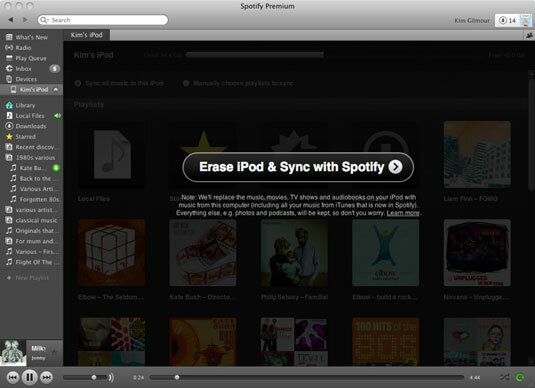 Since this is your first time using Spotify to sync your iPod, it will automatically ask you to sync the device by erasing all the data on your iPod. Go ahead and click on the button (as shown in the images below) and you are good to go. Now, Spotify will let you sync all your songs on Spotify with your iPod or even manually select the particular songs you want synced with the device. Now that you have learnt how to sync your iPod with Spotify, let's quickly take a look at the pros and cons of this option. It is an easier process when compared to using iTunes. Spotify offers an intuitive interface and does the job of syncing mostly on its own. One of the biggest downsides is that if you were to sync your iPod with Spotify, it will always erase all of the pre-existing data on your iPod before moving music. Not to forget, this method of syncing Spotify music with iPod only works with the music that you have duly purchased on Spotify. These are the best ways to sync Spotify with iPod. One has to simply follow the above given steps to successfully connect and transfer files from Spotify to iPod. Even though the iPod has a number of models and versions like iPod touch, mini, shuffle, nano, and classic, TunesGo Retro and iMusic are compatible with all these versions. There is no other app that even comes closer to the two products. Therefore, whether you want to sync Spotify to iPod, iPhone or the many versions of the iPad- in all cases you are better to use iMusic, the leading solutions available in the market today.